"Kaiserschmarren is the stuff of Austrian childhoods (and adulthoods). This recipe is great for Austrian kid dinners and American breakfasts alike." Combine raisins and rum in a small bowl and set aside to soak. Whisk flour and milk in a large bowl until well combined. Set aside for flour to hydrate for 10 minutes. Whisk egg yolks and salt into the moistened flour. Beat egg whites in a glass, metal, or ceramic bowl until foamy. Gradually add sugar, continuing to beat until stiff peaks form. Fold egg whites into the batter in 2 batches. Heat an oven-safe, heavy skillet over medium heat. Melt butter and pour in the batter. Sprinkle rum-soaked raisins on top. Let batter gently brown, 4 to 5 minutes. Reduce heat if batter browns too fast. Cut into quarters with a large spatula. Flip the quarters and let the other side brown gently, 4 to 5 minutes. Transfer the skillet into the oven and bake until pancake is set and puffed up, about 8 minutes. 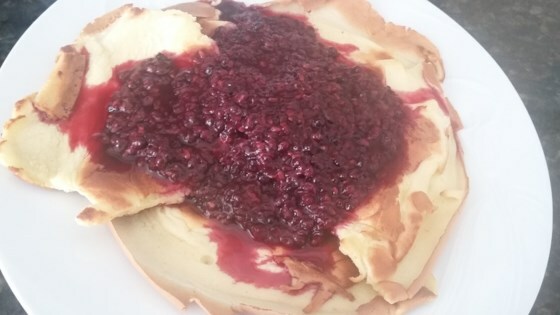 Use 2 large forks to tear the pancake into bite-sized pieces. Sprinkle with confectioners' sugar and serve with applesauce. Substitute water for the rum if desired. You can also use compote instead of applesauce.